Google ‘reasons for project failure’ and you get nearly 5 million responses! The question this blog asks is how many project failures are caused by project management shortcomings and how many failed projects were set up to fail by the organisation’s management? The Project Delivery Capability (PDC) framework described in our White Paper Project Delivery Capability (PDC) offers a useful lens to separate the failings generated by project performance from those imposed on the project, inadvertently, or otherwise by organisational management. Initiation: failures associated with project identification, business case development, requirements definition and portfolio selection; including establishing initial realistic time and cost budgets based on pragmatic risk assessments. Support: failures associated with the lack of effective senior management support to the project (Capability Support), including inadequate sponsorship, failing to provide appropriate resources, inadequate business inputs, lack of direction/decisions and allowing excessive change. Benefits: the failure to realise the intended value from the project’s deliverables associated with poor organisational change management, end use adoption and cultural resistance (for more on the overall scope of change see our White Paper, Organisational Change Management). The table below is based on an amalgamation of dozens of lists found through a Google search. Of the 29 causes of failure outlined above, only 7 are exclusively the province of project management. The other 76% involve or are exclusively the province of the organisation’s general and executive management as part of an overall ‘Project Delivery Capability’! This overall capability of an organisation to realise value from an investment in a project starts with selecting the right project to do for the right reasons, then doing the work of the project effectively and efficiently, and then making effective use of the project’s outputs to create value. Mess up any of the early stages and there are no benefits to manage. If the organisation fails to implement the changes effectively, the potential benefits are not realised. The project manager is only responsible for the bit in the middle – the ‘doing of the project’, a steering committee, sponsor or other management entity is responsible for the beginning and end parts of the overall process involved in PDC. Even the 24% of failures assigned to project management have a link back to the role of the Project Director within PDC. The organisation should provide oversight, training and support to ensure effective processes are used by their project managers and teams. Conversely, a skilled project manager may be able to overcome some of the organisational failings identified above; by managing upwards and operating effectively within the organisation’s political systems a skilled project manager can cover some failings, others are fundamental and will result in a failure regardless of the efforts of the project team. Therefore based on this table, it is reasonable to determine PDC is an executive and general management responsibility. The ‘project governance’ requirement within PDC is for the Board to ensure executive and general management accept this responsibility and excel in creating value for the organisation. Based on this assessment, my personal feeling is we as project practitioners need to stop referring to ‘project failures’ every time a project fails to deliver the expected value and start talking about ‘business failures’ when the organisation’s management fails to effectively manage or support the work and as a consequence, fails to achieve the intended/expected value. My last couple of posts have identified a gap in the overall management of projects and programs that is present in most organisations. This ‘Zone’ covers a range of organisational capabilities from the innovation and assessment of ideas that may develop into projects through to achieving the value the project was created to enable; see: Disappearing into the Zone. Effective project or program management cannot save a project that has been set up to fail by the organisation. Doing the wrong project ‘right’ or doing the right project as ‘right as possible’ with inadequate funding, resources, skills and management support may reduce the extent of the disaster but cannot prevent failure; see: Cobb’s Paradox is alive and well. The solution to this perennial problem, first identified by Cobb in 1995, is for the organisation’s leadership to demand that their executive create an effective project delivery capability (PDC). This name is suggested to place focus on the delivery of value to the organisation as a result of doing the ‘right’ projects ‘right’. 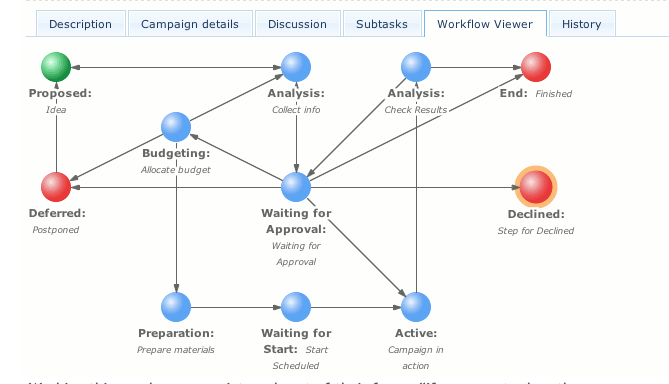 Managing the selected projects effectively is just one step in this overall value chain. PDC includes all of the aspects of project delivery discussed in our White paper PPP Taxonomy and outlined above, with a focus on realising value for the organisation. Implementing an effective and rigorous PDC structure will require a major change effort in many organisations and will challenge existing cultures, particularly the tendency to focus on ‘project failure’ rather than ‘organisational failure’ when the organisation fails to adequately manage the management of its projects. The extent of this challenge is outlined in our White Paper Organisational Change Management. Governance – the organisations directors / leaders have to set the right strategy, ask the right questions and require the right answers from their executive. Executive management (Purple) are responsible for creating the capability and culture of accountability needed to deliver projects successfully and realise the intended benefits. A key element in this is developing a rigorous portfolio management capability to select the best projects to fulfil the organisation’s strategy, based on consideration of each project’s feasibility and viability, within the organisational constraints of capability and capacity. 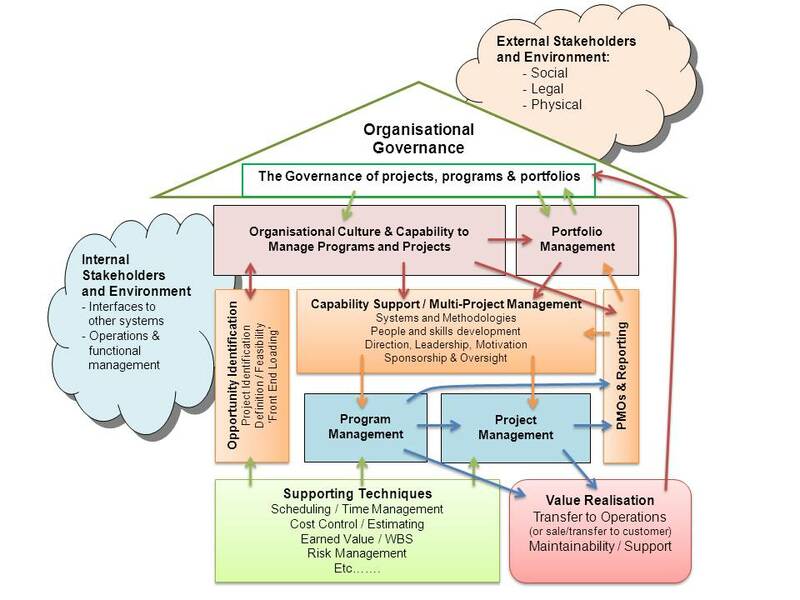 Organisational support processes (Orange) including opportunity identification and assessment, plus developing and enhancing the organisation’s project delivery capability including: organisational enablers, support systems, oversight systems, change management systems and value realisation. Program management can fulfil some of these support functions where several projects are being managed in an integrated way to maximise benefits. However, where programs are used by the organisation, the organisation’s overarching support processes need to be capable of supporting and overseeing the work of the programs as well as other independent projects. PDC reframes the project delivery/success paradigm. Change is needed, the approaches currently used in many organisations are generating project failure rates in excess of 50% and to keep doing the same thing, expecting different outcomes is, to quote Einstein, ‘the definition of insanity’! Focusing on developing an effective PDC will enable organisations to improve the way they manage the ‘doing of their projects’ and as a consequence increase the success rate resulting in increased value for their stakeholders. The ROI from improving an organisation’s PDC should be significant! One of the themes running through several of my recent posts is the importance of effective Governance. Both organisational governance and its sub-set project governance. Good governance is a synonym for ‘good business’, structuring the organisation to deliver high levels of achievement on an ethical and sustainable basis. This requires the optimum strategy and the right approach to risk taking supported by sufficient processes to be reasonably confident the organisations limited resources are being used to achieve the best short, medium and long term outcomes. 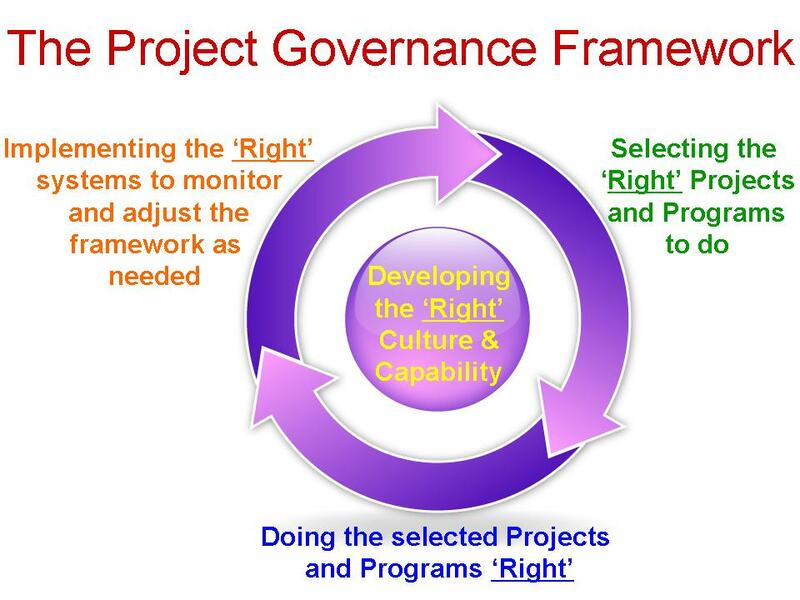 Project governance focuses on the portfolios of programs and projects used by the organisation to deliver many of the strategic objectives. This process focuses first on doing the right projects and programs constrained by the organisations capacity to undertake the work – Portfolio Management; secondly, creating the environment to do the selected projects and programs right- developing and maintaining an effective capability; and lastly systems to validate the usefulness and efficiency of the ongoing work which feeds back into the selection and capability aspects of governance. Within this framework, portfolio management is the key. Strategic Portfolio Management focuses on developing the best mix of programs and projects to deliver the organisations future within its capacity to deliver. This means taking the right risk and having sufficiently robust system in place to identify as early as possible the ‘wrong projects’, so they can be either be reframed or closed down and the resources re-deployed to other work. It is impossible to develop an innovative future for an organisation without taking risks and not every risk will pay off. 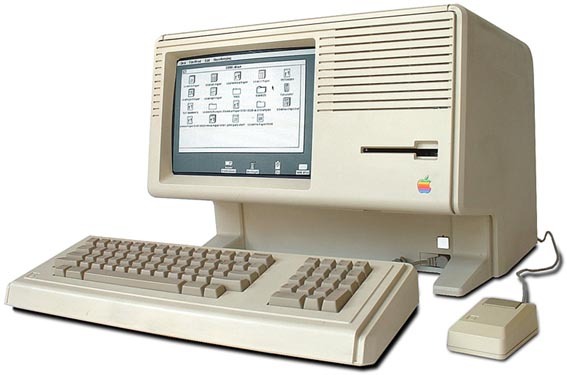 Remember Apple developed the ‘Apple Lisa’ as its first GUI computer which flopped in the market, before going on to develop the Apple Macintosh which re-framed the way we interact with machines. Obviously no organisation wants to have too many failures but good governance requires ‘good risk taking’. Apple had no guarantees the i-Pod and its i-Tunes shop would succeed when it started on the journey of innovation that has lead to the i-Phone, i-Pad and Apple becoming one of the largest companies in the world based on capitalisation. As Richard Branson says – ‘you don’t bet the company on a new innovation’ but if you don’t innovate consistently, obsolescence will be the inevitable result. The balance of project governance focuses around creating the environment that generates the capability to deliver projects and programs effectively, effective sponsorship, effective staff development, effective and flexible processes and procedures, simple but accurate reporting and good early warning systems to identify issues, problems and projects no longer creating value (a pharmaceutical industry saying is that if a project is going to fail it is best to fail early and cheap!). Good questions outrank easy answers! Every hour and dollar spent on governance processes is not being spent on developing the organisation. The challenge of good governance is to have just enough reporting processes embedded in an effective culture of openness and accountability to provide an appropriate level of assurance the organisation’s resources are being used effectively; whilst at the same time allowing innovation and development. Restrictive and burdensome governance processes are simply bad governance – they restrict the organisation’s ability to achieve excellence. For more discussion around the subject of governance see the previous posts on this blog. In 2011, another report into the management of IT projects asks the same question! This time the report was prepared by the Victorian Government Ombudsman, in consultation with the Victorian Auditor-General, it documents another series of failures largely created by executive management decisions. The report entitled Own Motion Investigation into ICT – Enabled Projects, examines 10 major Victorian Government ICT projects that experienced difficulties such as budget and timeframe blowouts or failure to meet requirements. Problems identified by the Ombudsman in the area of Portfolio management and governance include a lack of effective leadership, accountability and governance. He was particularly concerned about poor project governance, the lack of accountability of project stakeholders and a lack of leadership — a reluctance to take tough decisions. It is impossible to deliver a project successfully if the decision to proceed is based on inaccurate assessments in the business case. The Ombudsman commented on the inadequacy of business cases, the failure to fully define requirements for new systems, a general reluctance to change business processes to better fit with off the shelf products (to reduce cost and risk) and a ‘tick the box’ approach to risk management (ie, avoiding any real assessment of risks and opportunities). Linked to this lack of definition major project funding decisions were announced publicly before the business case was fully developed (representing either wishful thinking or a wild guess? ), and high risk decisions being made to only partially fund some projects. The solution to these issues is a robust and independent PMO that has the skills and knowledge needed to validate business cased before they go forward to management for decisions. Many years ago, KPMG released a series of reports that highlighted the fact that organisations that failed to invest in effective PMOs were simply burning money! The Ombudsman’s report shows that ‘burning public money’ is still a popular pass time. The Myki ticketing system was let to an organisation that had never delivered a ticketing system before. No contingencies were made for this high risk decision and the project is years late, $millions over budget and will only deliver a small part of the original scope. Agencies preferred to be on the leading edge rather than leveraging what had been done by others elsewhere. This may be justified but not without proper risk assessment, mitigation and contingency. There are always difficulties in transferring project risks to vendors, and dealing with large vendors who may be more experienced in contract negotiation than their agency counterparts. Whilst modern forms of contract provide opportunities to adopt innovative procurement processes that could significantly reduce project risks for vendors and customers these were not used. As our paper, The Meaning of Risk in an Uncertain World and the Blake Dawson reports clearly demonstrate, not only is it impossible to transfer all of the project risk to a vendor, it is totally counterproductive to try! Organisations that try to transfer ‘all of the risk’ end up with a much poorer outcome than those organisations that actively manager the risks in conjunction with their vendors. Large ICT projects are inherently complex and necessarily involve some significant risks. But these can be mitigated to some degree by taking heed of the Ombudsman’s observations, lessons learnt in other projects and the implementation of robust and independent systems. The PMI Practice Standard for Risk Management provides good starting point. The Ombudsman’s recommendations on how to address these issues can be applied to ICT and other projects undertaken by other state, local and Commonwealth government agencies, and in the private sector: Download the report. In my opinion, the primary cause of these failings, referenced but not highlighted by the Ombudsman, is cultural. Executives and senior managers overtly preferring the status quo and the current power structures they have succeeded within over leading the implementation of change that will deliver improved outcomes for their organisations but make people more accountable and redistribute organisational power. This was the focus of my last posting; Culture eats strategy for breakfast 2! As Martin Cobb observed in 1995, “We know why projects fail, we know how to prevent their failure — so why do they still fail?” Unfortunately this is still a valid question more that 15 years later and, without leadership from the very top, I expect the effect of this report will be little different to the dozens of similar reports generated over the years and we will still be asking the same question in 2020. The answer is culture and leadership – to change the culture within senior management ranks, the owners of organisations need to take actions similar to the Australian Federal Government and mandate effective processes and then measure performance in their implementation and use. The implementation of the Gershon Report that is being forced through the federal government departments is a Cabinet level initiative. It is still too soon to judge wether the initiative will be successful, effective culture change takes years to embed in major organisations, but at least the push has started at the right level. My feeling is that if the pressure is maintained for another 3 or 4 years (the original report was released in 2008) there may be some real benefits. To avoid similar reports to this one in the future, the leaders of other organisations need to take similar robust, strategic action tailored to the needs of their organisation. Project professionals can help by effectively communicating to your top-level executives the real benefits of effective project governance. For many ICT and other technical/engineering professionals this represents is a whole new set of skills to learn, my book Advising Upwards may help!